www.rockproducts.com ROCK products • November 2018 • 47 and preferred supplier status in the marketplace. The goal is to have the products that customers need, when they need them. However, with old technology and infrequent measurements, it is a guessing game. Newer technology can provide a cost-effective way to have better business intelli- gence on which to base decisions. 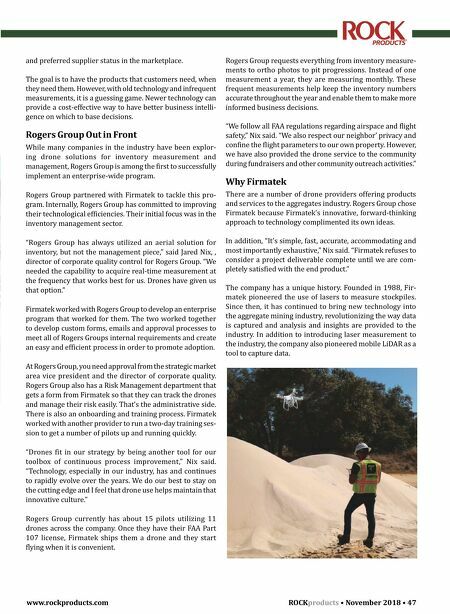 Rogers Group Out in Front While many companies in the industry have been explor- ing drone solutions for inventory measurement and management, Rogers Group is among the first to successfully implement an enterprise-wide program. Rogers Group partnered with Firmatek to tackle this pro- gram. Internally, Rogers Group has committed to improving their technological efficiencies. Their initial focus was in the inventory management sector. 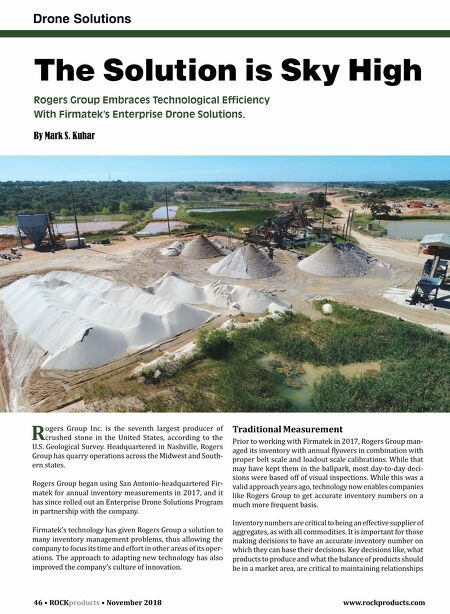 "Rogers Group has always utilized an aerial solution for inventory, but not the management piece," said Jared Nix, , director of corporate quality control for Rogers Group. "We needed the capability to acquire real-time measurement at the frequency that works best for us. Drones have given us that option." Firmatek worked with Rogers Group to develop an enterprise program that worked for them. The two worked together to develop custom forms, emails and approval processes to meet all of Rogers Groups internal requirements and create an easy and efficient process in order to promote adoption. At Rogers Group, you need approval from the strategic market area vice president and the director of corporate quality. Rogers Group also has a Risk Management department that gets a form from Firmatek so that they can track the drones and manage their risk easily. That's the administrative side. There is also an onboarding and training process. Firmatek worked with another provider to run a two-day training ses- sion to get a number of pilots up and running quickly. "Drones fit in our strategy by being another tool for our toolbox of continuous process improvement," Nix said. "Technology, especially in our industry, has and continues to rapidly evolve over the years. We do our best to stay on the cutting edge and I feel that drone use helps maintain that innovative culture." Rogers Group currently has about 15 pilots utilizing 11 drones across the company. Once they have their FAA Part 107 license, Firmatek ships them a drone and they start flying when it is convenient. Rogers Group requests everything from inventory measure- ments to ortho photos to pit progressions. Instead of one measurement a year, they are measuring monthly. These frequent measurements help keep the inventory numbers accurate throughout the year and enable them to make more informed business decisions. "We follow all FAA regulations regarding airspace and flight safety," Nix said. "We also respect our neighbor' privacy and confine the flight parameters to our own property. However, we have also provided the drone service to the community during fundraisers and other community outreach activities." Why Firmatek There are a number of drone providers offering products and services to the aggregates industry. Rogers Group chose Firmatek because Firmatek's innovative, forward-thinking approach to technology complimented its own ideas. In addition, "It's simple, fast, accurate, accommodating and most importantly exhaustive," Nix said. "Firmatek refuses to consider a project deliverable complete until we are com- pletely satisfied with the end product." The company has a unique history. Founded in 1988, Fir- matek pioneered the use of lasers to measure stockpiles. Since then, it has continued to bring new technology into the aggregate mining industry, revolutionizing the way data is captured and analysis and insights are provided to the industry. In addition to introducing laser measurement to the industry, the company also pioneered mobile LiDAR as a tool to capture data.